Listen to "Here Comes Massey"
Each issue will be packed with full color photos of tractors and equipment that represents the full Massey family line: giant steam engines from the Canadian Sawyer-Massey days, early horse drawn Massey Harris implements, Parrett, Wallis, Bull, General tractors, Massey Harril built tractors implements and combines, plus articles about the precision engineered Ferguson line of tractors and equipment. 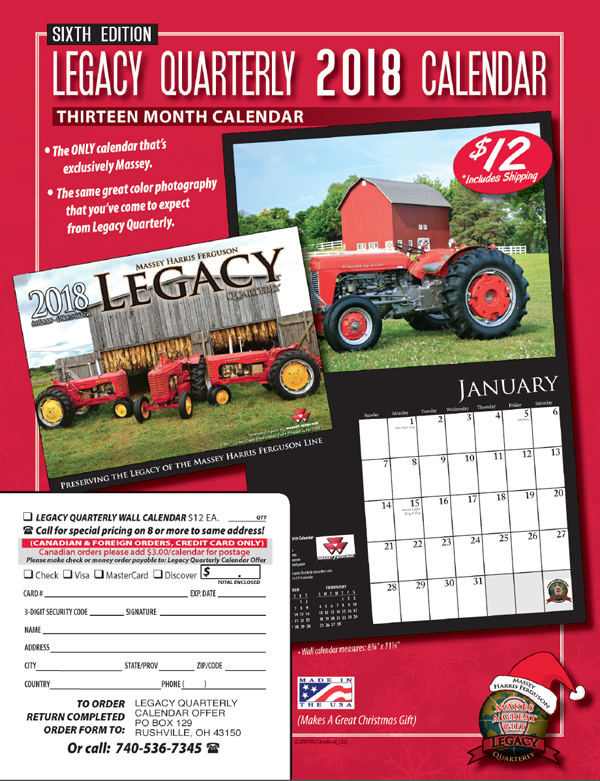 To complete the family line up: Massey Ferguson tractors, equipment and the entire line of lawn and garden tractors will be presented in each and every issue. Massey Harris was not only known for tractors and the finest combines on the market but the Farmer's Handy Catalog featured products for the home and farm: everything from water rams, bicycles, and freezers to kitchen ranges and wood stoves. Each issue will have a section, Massey Harris for the Home and Farm, that will examine all of the unique things that made Massey Harris such an influential company. Also look forward to a section called 'RFD' where readers can send in pictures of their own tractors and restorations, pose questions for other readers, search for parts or just establish contacts with other like-minded collectors.